The company's new toy blends origami with lego. Game design company and NEW INC member Move38 has been busy this past year showing their work at Maker Faire, South by South West, NYU Global Game Jam, IndieCade, and other festivals. Now, they’ve launched a Kickstarter campaign for their newest product, Troxes. Understanding that toys shape how we think, Move38 founders Jonathan Bobrow and Nick Bentley see Troxes as a way to help kids build an understanding of spatial thinking; the triangular blocks fit together in all sorts of ways that build strange, beautiful, and futuristic designs. Jonathan Bobrow: Hi! We’re the founders of Move38, an MIT Media Lab spinoff whose mission is to raise a new generation of systems thinkers with a new generation of toys and games. We’re releasing one such product to Kickstarter this week called Troxes, and we decided to interview each other because we’re too stingy to hire real PR hacks. So Nick, who am I? Nicholas Bentley: You are my business partner, Jon Bobrow, CEO of Move38. You are a brilliant designer-slash-technologist who has more hair than me. You invented Troxes and Blinks and a bunch of other things that you often invent while distracting yourself from your other inventions. You have a Master's from the MIT Media Lab, where you invented the aforementioned inventions. Before that you made bleeding-edge interactive museum installations for places like The Museum of Science and Industry, and before that you were a nationally-ranked junior Ping Pong player. JB: You are my business partner Nick Bentley, game guru of Move38. You are a doofus who hails from the board game industry and you seem to spend most of your waking hours inventing games. You do some game marketing, whether you want to or not, because you can’t stop talking about games. You have a PhD in computational neuroscience, as well as a chocolate problem. NB: The accuracy of your answers is chilling. JB: Thank you. Nick, can you describe for me what Troxes are? NB: Sure! 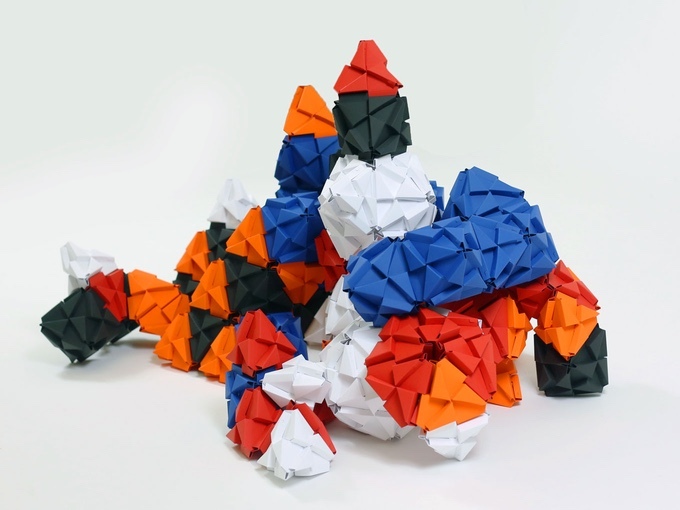 Troxes are 'Lego meets Origami.' They’re building blocks made of paper. They’re distinguished from most building blocks in that they have an unusual non-rectilinear geometry that most people don’t get a chance to play with. They are a) absolutely beautiful in our absolutely correct and unbiased opinion; b) a great way to stimulate your brain into thinking about space in new ways; and c) fun. NB: That’s correct, it is interesting, and I am a very interesting person. So Jon, how did you come to invent Troxes? JB: They were a thing I would work on after a long day of work on my Master’s project, which was tricky and technologically-involved. Troxes acted as a sort of nightly clearing of the air. Like Jack Daniels, but for a sober person. I hadn’t planned to do anything with Troxes but then serendipity intervened. In short, they got into the MIT Museum and then people started stealing them. NB: Stealing them? Who? Why? JB: I don’t know. The perpetrators remain at large. I suspect they were small. Either Hobbits or children. They’re probably playing with their ill-gotten Troxes right now. The thievery gave me the idea that maybe I should sell Troxes so Hobbits don’t have to risk prison or a lifetime on the run. Here we are. Now Nick, tell us about our Kickstarter campaign. To fund Troxes, we’re running a Kickstarter Campaign for thirty days starting on May 17. By backing it, you can get Troxes in different combinations of colors and numbers and at lower prices than they will go for in retail. The smallest package gets you fifty pieces, the largest gets you 2000. That’s enough to make something that will scare children and I suggest you do so if you plan on putting Troxes in a museum. The smaller packages give you one color, the larger packages give you multiple colors. There’s also some cool stretch goals like alternative colors, or maybe even glow-in-the-dark Troxes so you can scare children and/or Hobbits at night as well as in the daytime. JB: On that note, please join us on our campaign! We’d love to hang out with you there, where we can spend some more time making dumb jokes.